Operating since January 2015, the Denis Hurley Centre is a new building which continues a century-long tradition of using this site for Care, Education and Community. Care, because we are serving the needs of the poorest people of Durban. We feed over 1,000 homeless people each week, and offer showers and clean clothes. We run a free clinic especially helping those affected by AIDS and drug-resistant TB. 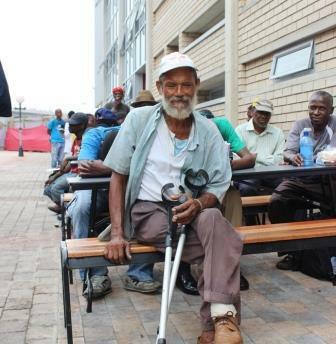 We go out to people living on the streets to offer HIV tests and life-saving medicines. We welcome refugees from across Africa helping them sort their documents and be integrated into the local community. Education, because the Church in this part of the city has for over 100 years been a beacon of education. We run English and Zulu lessons for refugees and help them to get their children registered in local schools; host 300 children and adults for classes to prepare for sacraments; offer training in sewing skills and plan to offer computer classes and other job skills; are working with the local university to provide health education to busy workers and commuters in the area; will soon house a City Museum exhibition focusing on the life and witness of Archbishop Hurley. Community, because we are at the core of a vibrant and diverse group of people who live happily side by side. For example, we have hosted an Ethiopian wedding, a Muslim bridal shower, meetings by union groups, political parties and football supporters, interfaith talks, lectures in Catholic Social Teaching, film screenings and performance classes, NGO conferences and a forum for drug users and local police to meet and talk. In the near future a coffee shop will provide further ways of building community. The Centre is 4 storeys high and hosts a number of social outreach projects. It also has a mixture of large, medium and small rooms available for hire. All of these facilities make sense when reflecting that the Cathedral’s name is "Emmanuel" which means "God is with us". While closely linked to the Catholic Cathedral Parish, the Centre also reaches out to and works with members of other local communities: the Mosque next door, the traders and shoppers from the Warwick Junction markets, members of other city-centre churches and faith community groups, artists and performers, tourists, locals and refugees. being engaged in the modern world and seeking to build God’s Kingdom here on earth and be, in Hurley’s words, a "community serving humanity". reaching out to the poorest and most marginalised residents of this part of Durban. working equally with South Africans and with refugees from other parts of the Continent. honouring and co-operating with people of all faith traditions. demonstrating the role of faith-based groups in transforming the city. challenging injustice and being a voice for the voiceless. finding ways to work with universities and other NGO partners. working with Government institutions and corporates while also being willing to challenge them.